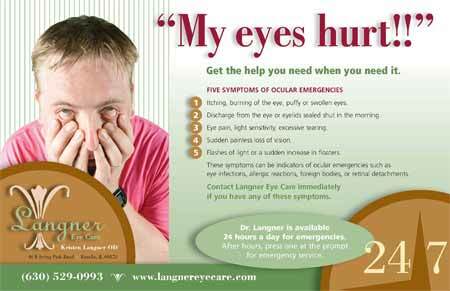 Langner Eye Care provides 24/7 emergency services including treatment of eye allergies, red eyes, ocular injuries and foreign body removal. Our state of the art equipment allows a thorough examination of your condition and a treatment plan can be implemented immediately. Dr. Langner can prescribe oral and topical medications for the treatment of allergies and infections. Don’t waste your valuable time sitting in an emergency room. We will make sure you are seen in a timely manner in the convienence of our office. Emergency visits are covered by your major medical insurance as an office visit, so you can avoid expensive emergency room copays! Please note, office visit copays, coinsurance, deductibles and coverage limitations still apply per your individual policy. If your condition requires the attention of an eye specialist, Dr. Langner can provide an emergency referral to the appropriate specialist, and see that you have an immediate appointment. Simple infections can become serious sight-threatening conditions. Dr. Langner’s expertise in treating ocular emergencies will ensure protection of your valuable sight. Call 630-529-0993 at any time for help. For after hours emergency service, call (630) 529-0993 and press one to contact Dr. Langner. Please note: If you are not currently within the Chicagoland area, please dial 911 for assistance.